CTV Calgary reports animal welfare investigators are on a case spawned by a Kijiji transaction. The dog was wearing a dog coat at the time of purchase and when the purchaser took the coat off she was horrified at the puppy's condition and took it to the Calgary Humane Society. The one-year-old Bichon-cross had obviously been neglected and abused. It was rated a one out of nine on a body scale chart. "One is the lowest rating an animal can receive on a body score. It is clear that the puppy had been neglected for quite some time." said Tammy Mazubert, department head of animal health. "We are very concerned about this puppy's welfare, and are warning people against purchasing their pets from these unethical sources." 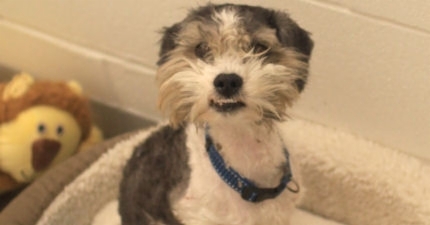 An investigation by Calgary Humane Society Peace Officers discovered that the puppy and his sibling were no stranger to the Kijiji market. In October of 2010, when experiencing a life change that did not allow her to provide care for the pups, the then owner of the pup and his sibling placed an ad on Kijiji as "free to a good home." Now, dog-loving do-gooders often have Kijiji in their crosshairs when it comes to allegations of puppy-millism and undesirable animal trafficking. Ultimately, Kijiji is just a medium. Animal abusers are animal abusers, regardless of Kijiji's involvement. Kijiji just makes it easy for bad people to connect with stupid people in all their forms. The investigator sums it up: "In this case, a well-intentioned owner tried to re-home her two Bichon-cross puppies. The individual who has allegedly neglected them took the pups for free, claiming to offer them a caring home then turned around to sell the puppies for a profit. The internet and channels like Kijiji provide anonymity to buyers and sellers that makes it a challenge to hold responsible those who mistreat their animals."